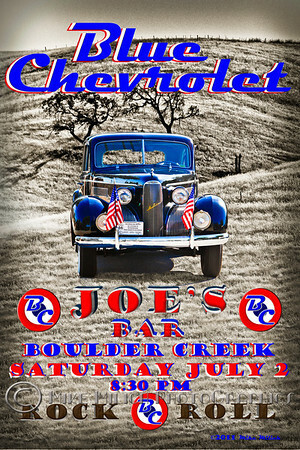 Blue Chevrolet at Joe's Bar for a pre-July 4th show. Boulder Creek has had a well attended 4th of July parade for many years and I wanted to get an old-time feel with this one. The 1937 LaSalle with flags was parked near the Costco in Santa Cruz, the hills were outside of Camp Roberts, CA. Got as much red, white , and blue on this I could.